The Girl Who Leapt Through Time Wallpaper: Time waits for no one. 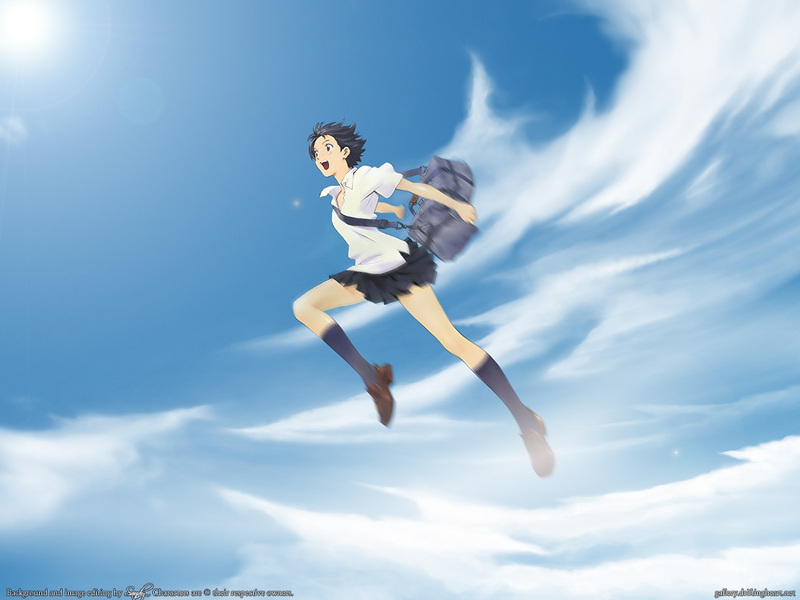 Minitokyo »	The Girl Who Leapt Through Time Wallpapers » The Girl Who Leapt Through Time Wallpaper: Time waits for no one. After seeing the animation movie "Toki wo Kakeru Shoujo", also known as "The Girl Who Leapt Through Time", I just had to turn the official poster into wallpaper because it deserves way more promotion. Since I have yet to see someone recomposing this artwork the way I wanted it to be, here's my take. Truth to be told, I painted the sky ages ago for an abandoned wallpaper. And guess what? They just matched perfectly the dynamics I wanted to give to this new piece of work! Unlike the original poster, I wanted to have cirrus clouds (wispy and transparent) and not cumulonimbus (puffy and solid). Because cirrus are high clouds, it gives the impression Makoto flies even higher in the sky, reinforcing the epic feeling of the scenery. They fill most of the right space and leave a hole to the right to balance the composition. For a depth effect, a light fog has been added at the bottom of the picture and for a dynamic effect, a motion blur has been partially added on Makoto. Afterall, Makoto jumped right among the clouds! ;) Enjoy the texture-free and text-free wallpaper! Browse The Girl Who Leapt Through Time Gallery: Recent | Popular. Simple, but really neatly done! I love the blurry effect on the character, it gives a sense of movement. Simply lovely, I love the clouds, they look very beautiful. I agree the clouds look nice. And the blurry effect is just perfect. Still it seems to me, it miss something, like a big contrast of colors. I saw a lot of poster in Japan in spring for this movie, it seems a big production. I'll probably watch it, since I heard good comments about it. I remeber watching this movie, its soo good. Nice job with it! Oh yeah nice scan ! :D LOVE IT ! what a wonderful sky! thanks!